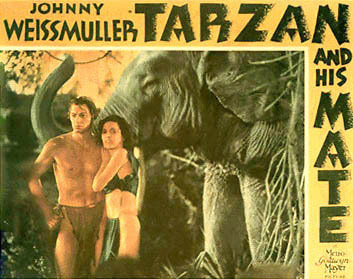 A terrific film for Tarzan buffs. I recently bought my DVD copy in a set of six. Considering it was made in 1934 the photography and special effects are totally acceptable. There's loads of impossible action we're expected to buy and Maureen O'Sullivan completely steals the film when trying on the latest fashions, unintentionally tantalizing Tarzan and the ivory hunters, and performing an underwater aqautics ballet with her leading guy. I've seen this film several times but never with all this complete footage! It was worth figuring out where my pause, zoom, and REW buttons were just to see Jane again and again. This section of footage wouldn't be approved by mumsy nor other puritans but I quickly set those values aside and began to enjoy it for the sheer beauty and content it portrayed of Tarzan and His Mate. Nor would the SPCA approve of the shooting of animals, but I'm sure that's what was going on in this film. None of the "one shot kills" and a dead stuffed lyon lies motionless on the ground. These cats were hit hard and continued hurting. Very realistic stuff. Not that I'm an advocate, but I'd rather have realism then obvious film fraud that ruins the atmosphere.